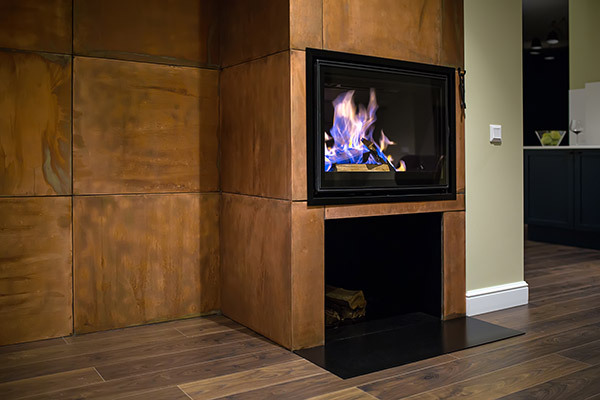 Having a fireplace is one of the best ways to keep warm during the frigid months of the year. That’s why it’s not only good to have it working right, but also to have the glass clean inside and outside of the fireplace. 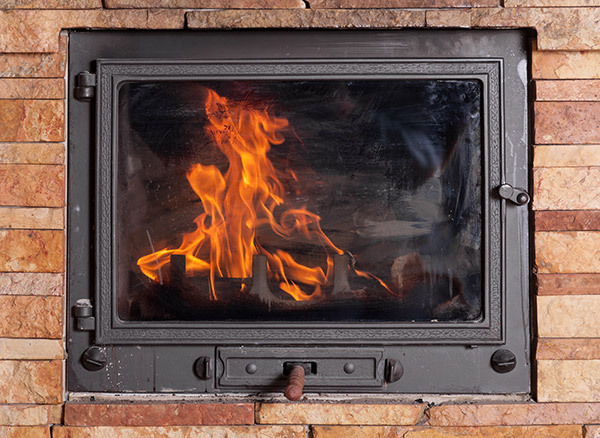 Sure, cleaning a wood stove, gas or electric fireplace can take some time and effort depending on how much soot has built-up over the years, but the cleaning process is well worth it. If you maintain the glass properly, you’ll be able to practice good habits that keep your fireplace safe and efficient in the long run. Most people don’t clean their fireplace often enough. Each week, your fireplace glass doors should be cleaned. The type of wood used will also help you with the cleaning process. Use hardwood over softwood, or you may have to spend some extra time cleaning. If your wood is unseasoned, of poor quality and/or wet, your build-up inside the fireplace will be harder to clean. If you use your fireplace a lot, you’ll need to clean it more. Keep up with the cleaning process no matter how often you use your fireplace. Burning a hot fire actually helps remove a lot of stains on your fireplace glass door. Before you even start cleaning, you can try this trick to get some of the build-up off your glass door. Hot fires tear down stains and make it easier for you to finish cleaning. Try burning 1 to 2 fires to release the soot. Also, there are creosote products that actually remove soot from your glass doors, or a product called “Red Devil Lye” is another way to soften the build-up. After you’ve burned a hot fire in your fireplace, let it cool down before continuing. This process can take anywhere from 6-8 hours before you start cleaning anything. Using a temperature gauge will assure your safety as well. Next, use a paper towel or cloth with microfiber to begin wiping off the fireplace glass door. If you don’t have any of those materials at your disposal, newspaper can also work. Soak the material in water first and put on gloves before wiping. Reusable or disposal gloves both work well when cleaning fireplace glass doors. As you start wiping, clear off the first layer of haze that is on the door itself. While wiping inside, squeeze out the material every so often to get the residue off and re-soak in water. Sometimes, this process is enough to get your fireplace door looking good. If there’s still residue on the glass door, move on to the next option for cleaning. Adding ashes to a cleaning paste might seem crazy to most people, but it actually could help clean your fireplace. Grab white ash out of your fireplace and mix in a small amount of water. Stir the ingredients together until it becomes pasty. Add more ash and water accordingly. Use a microfiber cloth for this portion of the cleaning. Dip it into your newly made paste, and move in circles to apply it on the glass to help remove any soot that has stuck to the door. Just like when wiping, rinse out the microfiber cloth in water and reapply the paste if necessary. Why are white ashes from wood so effective when cleaning a glass door? Ashes come with a pH level that’s extremely high. In turn, wood ashes are full of calcium carbonate or CaCO3. This mineral is found primarily in rocks like limestone, but is also in pearls, snails and eggs. It can be used in supplements and antacid pills. If you’re not comfortable using white ash paste or don’t have white ash in your fireplace, you could use a commercial paste. These are usually sold at many home improvement stores, and work just as well. But, this product would cost you more money during the cleaning process. If your fireplace glass doors are still stained, consider using a heavy-duty cleaner. To remove these stains, try a wood stove cleaner by spraying it on the glass. These types of cleaners usually have ammonia in them, which may cause streaking if you’re not careful when cleaning your glass doors. Wait 30 minutes before you start cleaning anything. After the product soaks on the glass, use a damp cloth to wipe off any stains and extra cleaner. Another glass cleaner that’s effective when cleaning fireplace doors contains silicone. This compound is best used after the glass has been cleaned. It helps create a barrier in between the glass and soot build-up. This may mean you won’t have to clean the glass door as often. Hooray for modern advancements! Still, read the instructions for best results instead of trying to guess your way through using this cleaner. Spray this solution onto the glass door and wipe away the streaks before your eyes. This will assure that the job is complete, while looking great, too. You can do this on the inside and outside of the glass. Many have made the mistake of using a razor to clean their glass doors. This might seem like it would work, but a lot times, this puts scratches on glass doors or the glass breaks. Adding insult to injury, soot will find a place to stay if scratches are on your glass. Ceramic glass is used in most fireplace doors, and this type of glass is weaker than normal glass panes, so razors can really cause havoc. After you’ve done all the work cleaning the glass door in your fireplace, make sure you’re burning fires that are clean. This can take place when you have clear air vents to allow smoke to get through. Never burn coal, garbage, a mass of papers or wood that’s treated in your fireplace. Lastly, smoldering fires can add more soot to your fireplace. Add more air by opening the vents to assure that this doesn’t happen to your fire. By following all these steps, you’ll most certainly have an amazing looking glass door on your fireplace. Furthermore, it’ll help your fireplace run more efficiently each and every day. When lighting a fire, don’t have any wood touching the glass or your burn stains may reappear quicker than you ever wanted. Never place more wood in your fireplace than you need. This will not only keep your glass door clean, but your fire will also be separated from the door at a distance that’s safe. So, enjoy what you worked hard on and light a warm fire for all in your living room to feel. Also, the cleaning doesn’t end at your glass doors. Each year, you must remember that your chimney needs to be inspected and cleaned before you use it. When the time comes for this, Early Times is the best option in the Chicagoland area. For any of our services, you can start with a free quote online – it’s quick and easy.